Posted on Wed, Apr 18, 2012 : 10:29 a.m. Downtown Ann Arbor’s Main Street landed a spot in the top 15 ‘Greatest Main Streets’ in America in Travel & Leisure magazine. Main Street in downtown Ann Arbor. Ann Arbor’s downtown area is described as “full of activity,” thanks in part to the University of Michigan students who make up more than a third of the population. Ann Arbor made a similar list in 2009, when it was recognized in the American Planning Association’s Great Places in America: Streets contest. Read the full story and see the other cities on the list . Thu, Apr 19, 2012 : 7:53 p.m. I do not think we have special Main Street - i think the restaurants aren't that good for the price. I think they were good and fresh 10 years ago but they are living on past reputation. I have seen other towns get some good food choices with reasonable price (and that actually change their menus over time). Some cute stores would be nice too!. It has been done elsewhere and it can be done here. Thu, Apr 19, 2012 : 2:27 p.m.
From the original article, it looks like the writer specifically chose towns where there is a Main Street. This is not simply about a downtown area. It's a cute fluff piece, and it's nice to see AA show up, but it's not a definitive &quot;these are the best downtowns in cities under a certain size and there can be no argument ever&quot; list. Take it for what it is, and realize that if 's major shopping district wasn't included, you can still like it and enjoy it just fine. Thu, Apr 19, 2012 : 2:31 p.m.
That was supposed to be &quot;Insert Your Favorite City's&quot; major shopping district, surrounded by lt/gt symbols, but apparently it was taken for HTML and removed. Thu, Apr 19, 2012 : 1:01 p.m.
Thu, Apr 19, 2012 : 12:32 p.m.
Thu, Apr 19, 2012 : 11:48 a.m.
Thu, Apr 19, 2012 : 5:41 a.m.
Agree with Machine and Barzoom. Main Street is only ok. Want to amp it up fast and for real? Close it to traffic, a' la Pearl Street in Boulder. Between Huron and William. It would become a destination. But, that would take guts that the city lacks, and would lose a few precious parking spots. Thu, Apr 19, 2012 : 5:25 a.m.
Reading the actual article, one gets the impression the selections are merely opinion of the writer and not a poll. I wonder how much research the writer did? Having lived in Ann Arbor for a few years before moving last year, I don't have to tell you that there are way too many aggressive panhandlers in Ann Arbor in general and Main Street specifically. It got to the point, my wife and I avoided Main Street after a particularly ugly confrontation with a panhandler. Based on the stock photos used in the article, I wonder if the writer even visited Ann Arbor prior to writing the article? Thu, Apr 19, 2012 : 5:21 a.m.
Everyone can agree that Main Street is world class. Thu, Apr 19, 2012 : 4:05 a.m.
Main Street is a great street. I love how, whenever there's any positive press about A2, all the naysayers come out of the woodwork. And by &quot;love&quot; I mean &quot;think it's absolutely ridiculous&quot;. My only complaint about Main is that I've noticed more and more packs of motorcyclists cruising. It's hard to enjoy a walk or outdoor dining when there's a bunch of loud Harleys coming by every couple of minutes. Unfortunately, lists like this one will only attract more of them. Can we all make a concerted effort to tell these motorcyclists to go back to Royal Oak? Thu, Apr 19, 2012 : 4:39 a.m.
Thu, Apr 19, 2012 : 2:33 a.m.
Um, folks...this AA.com piece implies that Ann Arbor's Main Street &quot;made a best-of list&quot;. But if you look at the Travel and Leisure piece, it looks like one travel writer's little list. It's not a poll, so far as I can tell, it's not a consensus view of travel writers for the magazine. The writer, Wayne Curtis, seems to be based in New Orleans, and he has written about cocktails. Indeed, he seems a little obsessed with cocktails. So, it wouldn't be surprising to me if he digs Main Street as it currently exists. But if you look at the article, it's not even like he did a detailed bit of travel research, but rather as he puts it &quot;we scoured the listings&quot; of organizations dedicated to Historic Preservation and to urban planning . To find, I presume, places &quot;listed&quot; with them, lol. I find it a little disconcerting that the AA.com seems to need to make this about how &quot;we made a list&quot; when it's not even that, but, whatever. Thu, Apr 19, 2012 : 3:43 a.m.
Cocktails? Why didn't he to the Bar in Braun Court and pay too much for a mixed drink? Thu, Apr 19, 2012 : 3:19 a.m.
Thu, Apr 19, 2012 : 12:54 a.m. I'm with Machine's comments. Main Street in A2 used to be a fun place with a wide variety of shops, for all income ranges, and restaurants that were not all upscale! How about that! Now it's just an overpriced place full of restaurants and gift shops catering to students and their rich parents serving mediocre food. No book store, no mid-level department store, etc. The cartel that controls the rents has done this to A2. Top 15? I think not. Too many aggressive panhandlers. Parking is nonexistent and way too expensive. College towns with cool downtowns include Madison, WI, Northampton, MA, and Ithaca, NY. Thu, Apr 19, 2012 : 1:40 p.m.
You may need to get out more Sally... I'm certainly not rich and both my children are recent UM grads (no scholarships either!). We love walking along Main Street. The restaurants aren't any more expensive than most others around this State and the food I've ordered (Gratzi, O'Neill's, Palio, etc.) is always quite delicious. Try Parking at Fourth &amp; William; just steps from Main Street and there is always space and it's only $1.30/hour for a covered spot. I've rarely seen &quot;aggressive panhandlers&quot; on Main Street (they tend to hang out on Liberty and State, and they're not all that aggressive). I've not been to Madison, but I've been to Ithaca and unless I missed it, there is no cool downtown area there... definitely not like A2. Thu, Apr 19, 2012 : 1:38 a.m.
You must have arrived here after Kleins and Woolworths. Is the parking &quot;way too expensive&quot; or are you just way too cheap? Thu, Apr 19, 2012 : 12:04 a.m.
Mark's Carts and the upcoming beer garden will help counter the gentrification arguments. I think the area is improving. Thu, Apr 19, 2012 : 5:29 p.m. Right, because yuppies hate food carts and beer and wine! Thu, Apr 19, 2012 : 4:30 p.m. Funny, Mark's carts are the personification of gentrification. Costs 2x as much to fill up there than at an ethnic Chinese restaurant Lunch special. I do like Marks Carts, but it definitely caters to an upscale crowd. Wed, Apr 18, 2012 : 10:56 p.m.
Oh, my God. Downtown Ann Arbor? &quot;Machine&quot; is right on with his comments. Take a little trip to Madison, Wisconsin, and see what a vibrant place really is. I've run into lots of students and others who say that Ann Arbor is &quot;just like&quot; Madison, but they've never been there and they don't have a clue about any of the real differences between Ann Arbor and Madison.. To say that Ann Arbor is absymal is being quite polite, and very optimistic. Thu, Apr 19, 2012 : 2:22 p.m.
Madison is also the capitol of the state - not really a fair comparison. I wouldn't describe AA as &quot;just like&quot; it. Madison is more a cross between AA and Columbus - bigger city feel with more of the college vibe thrown in. Remember, contrary to what the internet would lead one to believe, it's possible to like more than one thing! I like what AA has, I've enjoyed visiting Madison, and, shocking I know, I've had great times in Columbus. Thu, Apr 19, 2012 : 12:36 a.m.
oh soooo true! Totally different place - cyclists don't get killed, the restaurants have much better food and more reasonable pricing. Better energy - nicer people. Wed, Apr 18, 2012 : 11:34 p.m. Problem with Madison is the population of 233,000 gives it too much of a big city feel. Wed, Apr 18, 2012 : 10:36 p.m. Need a small bookstore with a decent magazine rack and cafe inside, back on Main Street. This may be off topic, but I would also like to see a laundromat somewhere in downtown Ann Arbor. Many people must now drive across town to do their laundry. Could put a cafe, resturant, art gallery, televisions etc into it and make it a fun place to wash clothes meet people. Live Music? ha ha.....might work....time to rethink doing laundry. Thu, Apr 19, 2012 : 1:48 a.m. There's a place called Duds 'n Suds in my hometown, in another state. Up-scale laundry + drinks + entertainment. Is that what you had in mind? Wed, Apr 18, 2012 : 11:55 p.m.
Liberty street has a nice used book store with hundreds of really nice books in it. Reminds me, need to get down there some time. Wed, Apr 18, 2012 : 10:07 p.m. 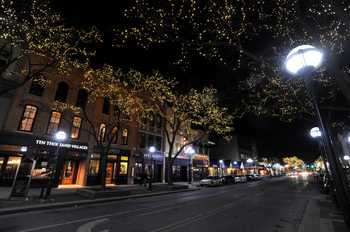 Whether or not it deserves to be in the top 15 is a matter of opinion, but my opinion is that Ann Arbor has a wonderful atmosphere on Main Street and off streets! I always can park and know all of the spots. I often park on the street, and it is cheap! Ann Arbor is the place to live for me. Bless our town with positivity and forget all the whining about parking and whatever. Wed, Apr 18, 2012 : 9:51 p.m.
Main Street at least is better than State Street....though, I guess that's not really saying much. Main Street has some gems that I tend to frequent...but I wouldn't say it's a Top 15 Main Street in the U.S. Wed, Apr 18, 2012 : 9:12 p.m. Wed, Apr 18, 2012 : 8:41 p.m. Wed, Apr 18, 2012 : 11:16 p.m. Wed, Apr 18, 2012 : 7:25 p.m. It's on a par with Boulder City, Colorado. Thu, Apr 19, 2012 : 4:15 p.m. But if only we could close off main st., at least on weekends. Wed, Apr 18, 2012 : 6:40 p.m. I like the Main Street in Plymouth and the one in Northville. Wed, Apr 18, 2012 : 11:54 p.m. I could not agree more. The shops in Northville is so quaint. Even the restaurants. Then there is a really nice park nearby to walk off the great food we stuff ourselves with. Wed, Apr 18, 2012 : 6:26 p.m. It's nice that South Main street made the list, despite the fact that one often has to travel down the miserable-looking, potholed stretch of North Main (coming off of M14) to get there. Wed, Apr 18, 2012 : 5:49 p.m.
full disclosure question: how much did Ann Arbor pay to be considered? I ask because most of the time these things come with a heft fee for entry. Thu, Apr 19, 2012 : 5:08 a.m.
thing is, they weren't even &quot;considered&quot;, because this isn't actually a 'best of' list, d'oh! How much does the reporter get paid to scour the mags for mentions of Ann Arbor that could be turned into misleading headlines about &quot;makes greatest streets in the nation list&quot;?! Or does T &amp;L call up the locals when they mention their city so that they can maybe generate more page hits of their own? That seems to be the question in this case... This article was about the writer looking at lists from Urban Planning and Historic Preservation rosters to see if there was some way he could create a little list of small downtowns one could visit as a way to get off the highway and see &quot;America&quot;, with its history and historic buildings, and maybe get a bite that would stand as an improvement over rest stops. Main Street Ann Arbor definitely qualifies there! But it did *not* &quot;make greatest streets in the nation list&quot; as the headline states, that is patently ridiculous to claim. Wed, Apr 18, 2012 : 5:18 p.m. Check out the rest of the towns in the article - quaint, little, places like like A2, that few have even heard of, let alone visited. A2 is just another mildly interesting, over-rated, college town. YAAAWWWWNN! Wed, Apr 18, 2012 : 5:29 p.m.
You are indeed well named. Wed, Apr 18, 2012 : 5:09 p.m.
Really? I can think of 15 streets that are way better than AA's main street. Wed, Apr 18, 2012 : 11:14 p.m. Wed, Apr 18, 2012 : 4:55 p.m. It must be great to be within walking distance because parking is very costly and both diificult &amp; time consuming to find. I'd like to visit downtown more often and I live nearby but it's just too much hassle when driving. Wed, Apr 18, 2012 : 9:57 p.m. Wed, Apr 18, 2012 : 9:47 p.m.
Have you ever visited Chicago or New York? To park in a structure in either of those cities, it costs AT LEAST 20 bucks. Ann Arbor's measly dollar-and-some-change parking is nothing. Wed, Apr 18, 2012 : 7:38 p.m.
parking in Ann Arbor is extremely cheap for an area that actually has a vibrant downtown. Trying to compare it to surrounding places like Chelsea, Dexter and Saline is not an apples-apples comparison. Additionally, you can find plenty of parking if you're willing to walk a block or two. This concept of being able to park your car in front of the store and walk right in does not, and has never been, a part of urban living. Wed, Apr 18, 2012 : 5:20 p.m.
$1.10/hour in the public parking structures is not &quot;very costly&quot; all considering. And I've never not found a spot to park at the Fourth &amp; William Structure which is a quick few steps away from Main Street. Wed, Apr 18, 2012 : 4:27 p.m.
Machine...Couldn't agree with you more. In addition, between over priced parking no interesting shops, and aggressive panhandlers it's just not fun anymore. Kerrytown is the exception. The rest of downtown Ann Arbor should take a lesson. Yes, it's been downhill towards boringness ever since Woolworths left. And, oh, how I missed Kleins. Wed, Apr 18, 2012 : 4:22 p.m. I know it's not right downtown, but the Nichols Arcade is a great piece of Ann Arbor architecture. Paris is famous for its arcades (I think it has 14 or so remaining), and we are lucky to have this one. It's the precursor to the shopping mall, but with better brickwork. Wed, Apr 18, 2012 : 7:01 p.m.
i love the arcades of paris. hey, i wonder if we're related! Wed, Apr 18, 2012 : 4 p.m. I have to agree that Main Street is one of the best areas in the state to visit. I love all of the restaurants/bars and such and have found it to be a pretty good place to shop too. Wed, Apr 18, 2012 : 11:53 p.m.
That is if you take an AATA bus downtown to Ann Arbor. Otherwise, I refuse to pay for parking and the cost to buy anything there. As I see it? Ypsi has great restaurants and a great library to boot. Wed, Apr 18, 2012 : 3:54 p.m. Downtown Ann Arbor used to be a fun, eclectic place with an interesting mix of businesses. Gradual gentrification has converted it into a boring district featuring little besides coffee shops, art galleries, and overpriced restaurants with mediocre food. Thank goodness for the few interesting things that remain like The Ark and Fleetwood Diner. If this is a top 15 Main Street, I'd hate to see the other 14. Thu, Apr 19, 2012 : 8:15 a.m.
Thu, Apr 19, 2012 : 2:14 a.m. Right on @Machine :) ! Thu, Apr 19, 2012 : 12:55 a.m.
We used to go wander and explore and have a reasonable meal. Now we go early so we can park, go directly to the food and/or target for the visit and then go home. Our visits are now singular in nature and far less frequent than before.. The food is skewed to way over priced for what is delivered to the table. If I'm going to spring for a San Franscisco/NYC prices, I have the expectation of equivalent food (consistantly) and I have enough experience to know what that means. At least the Fleetwood is appropriately priced for what is serves. . Wed, Apr 18, 2012 : 7:37 p.m.
how can you complain about bland food and celebrate the Fleetwood Diner in the same sentence? Wed, Apr 18, 2012 : 5:50 p.m. Wed, Apr 18, 2012 : 5:14 p.m.
Agree with ArgoC... and I love Connor O'Neills, Real Seafood, and Gratzi; plus the Black Pearl, Palio, Prickly Pear, Raven's Club, Cafe Felix, Melting Pot, and Jolly Pumpkin. There's Abracadabra Jewelry (great prices on beautiful pieces), Chris Peterson Jewelry (amazing! ), Crazy Wisdom (crazy cool! ), Elmo's t-shirts. The The Rolling Sculpture Car Show, FestiFools, Art Fair, Annual Grub Crawl, Midnight Madness... it's all good! Wed, Apr 18, 2012 : 4:02 p.m.
And Peaceable Kingdom, Selo Shevel Gallery, the Himalayan store, Ten Thousand Villages, FallingWater, and on and on. Wed, Apr 18, 2012 : 3:46 p.m. It's great to be within walking distance of downtown Ann Arbor, especially during favorable weather. I enjoy early morning treks, lunchtime excursions, closed-street special events, lots of people and activity, weekend hustle and bustle, and general feelings of good energy and vibe. Don't forget the short jaunt to Farmers' Market and Kerrytown. . . Thanks to the many businesses and property owners that make our Main Street and downtown area special! Wed, Apr 18, 2012 : 11:51 p.m.
Must be nice to be able to afford the taxes there. I know I can't. Wed, Apr 18, 2012 : 3:26 p.m. Wed, Apr 18, 2012 : 9:05 p.m.
Back Alley Gourmet, a deli, is actually in the South Main market. Try it sometime, it is a great alternative to that other deli that gets all the press here.